I read this novel and my heart didn't break. Yes, it's true. I read a Hannah Moskowitz novel and did not emerge from it a sniveling ball of snot, tears running down my face because of my broken heart. I didn't think it was possible to read a Moskowitz novel and not be heart-broken on some level, but it is. Folks, Marco Impossible is the time that Hannah Moskowitz wrote a novel with a happy ending. And we all cried anyway. Marco Impossible is my first Middle Grade novel from Hannah Moskowitz but, despite writing for a younger audience, Moskowitz manages to retain both her depth of feeling and complexity in this tale. Stephen and Marco are best friends, gearing up for high school in just a few months. Marco, however, is moving away to a private school and will never see the love of his life, Benji, ever again. Thus, Stephen and Marco are forced to make an elaborate plan to break into senior prom where Benji will be playing with his band, all so that Marco can confess his true feelings to Benji. Granted, there isn't a bomb involved in the plan like the cover may lead you to believe, but this book is just as spectacular without it. 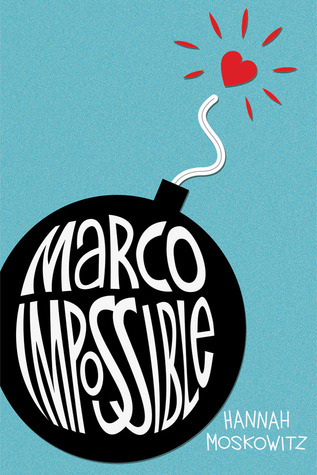 From the very first page, it is clear that Marco Impossible is an incredibly fun ride. Marco and Stephen are wildly different characters, but together, they can take on the world. Stephen, who narrates our story, has a large family and has grown up in the shadow of Marco, who is loud, boisterous, and witty. Unlike Stephen, Marco is an only child, tentative about having siblings despite the fact that his parents are adopting a child overseas. It is obvious that although Marco relies on Stephen just as much as Stephen relies on Marco in this friendship, there are deep secrets between the two, whether it be Stephen who is still upset at having found that his father was cheating on his mother through the detective games that him and Marco played or Marco, who has dark secrets he won't part with. Marco Impossible chronicles the plethora of difficulties Marco and Stephen face as they plan, and later execute, the adventure that will lead to Marco confessing his love for Benji, but it is also the tale of their friendship. Moskowitz brushes upon many subjects in this novel that are all serious and prevalent today, but best of all, she deals with them in an accessible and friendly manner, all while conveying the horror of the situation. In addition to that, though, the sibling relationships prevalent throughout the novel are masterfully written. With the number of siblings that Stephen has, it would have been easy to make at least a few of them similar, but instead, each of these secondary characters is well-rounded in their own right, all suffering through their own problems. Yet, best of all, this is a story of friendship. It is the story of two friends who think they know each other, but not fully. Both Marco and Stephen are disastrously flawed characters, but it is impossible not to fall for them and their crazy adventure. Moreover, throughout the novel are short excerpts from the detective log that Marco and Stephen keep: hilarious momentums certain to delight the reader. All in all, Moskowitz really has written a funny, meaningful, and unforgettable story - once again. With authors like her around, finding excellent novels doesn't seem quite so impossible anymore. I'm glad there is a Moskowitz book with a happy ending as I'm much more inclined to read that one. I have no qualms about this book as Middle Grade as it sounds thoughtful, fun and emotional. Maybe this is why it has a happy ending? The friendship between Marco and Stephen sounds very endearing too. I have never read a Hannah Moskowitz novel before. I KNOW. But honestly, none of them have grabbed my interest no matter how much people have loved the books. I might have to check one of her books out though! I'm so glad to have read your review. I have this one but hadn't heard anything yet. Now I'm really excited to read it! I really feel like I'm missing out on something by not having ever read a Hannah Moskowitz book. WHAT HAVE I BEEN DOING?!?! Something to rectify in 2013? Any recs on which of her books I should start with first? This book sounds so fun, I think I knew it would be from that cute, bright cover! I don't mind flawed characters either, I think Hannah's boys in Gone, Gone, Gone were also flawed but I like them all the same. I will defo add this to my to-read list! I have to be honest and say I haven't read a lot of MG fiction. I want to - I hear about some really great books through fellow bloggers and readers - but I keep putting it off! Sounds like this might be a good starting point for me, though! Okay, have I been living under a rock? I had no idea that Moskowitz wrote a MG novel and I don't recognize the title or cover of this book AT ALL. That said, I think this one sounds the most like something I'd like of her books. I rather like optimistic (or at least pretty happy) MG books and cute detective stories. I'm also interested to see if the large family is as well done as you say--I know a bunch of huge families in real life and every kid has a different personality (obviously) but I haven't read to many (or really any?) books that do a wonderful job with them. Confession: I haven't read anything by Hannah Moskowitz Keertana. I KNOW! I can't believe it either. I love that you managed to close the back cover of this one snot-free but still madly in love with the story, that's always a bonus:) I'm a huge fan of flawed characters, so I think I'd really enjoy Marco and Stephen! I honestly was not interested in this book whatsoever from the blurb, and yet, reading your review and realizing that it is, more than anything, a story of friendship has me much more interested than before. I'm shocked at the variety in HM's work--I have Zombie Tag, another of her MG books, and I'm now much more convinced that I should make time for it. I'll likely find some unexpected depth! I love an emphasis on friendship. It's one of the few reasons that I'll decide to pick up a MG book. My last read, in fact, was a MG book, and it went pretty well. I still haven't read anything by this author yet, if you can believe it. I really should get a move on, shouldn't I? ;) Fantastic review, Keertana! I never really considered this one before, but it's definitely going on the list now. On a side note, I'm looking forward to your thoughts on The Lost Conspiracy. I hope you enjoy it as much as A Face Like Glass! Your reviews are always so fantastic. You have successfully made me want to read this. Thanks Keertana. I've never read anything by this author, but I plan to avoid the sad books! This one looks like fun - and that disaster must ensue with that bomb on the cover (especially if you say that there isn't actually a bomb in the story). So Marco wants to break into senior prom? But it's a Middle Grade book? Does that mean that he's in middle school? Anyway, another great review from you. I still have yet to read a Hannah Moskowitz book but I don't think I'll be able to resist this adorable cover. Plus a happy ending! I'm such a sucker for those! I'll definitely check this out. Awww, I'm pretty sure I'll like this one too, although I do tend to avoid MG. No matter which age group she writes for, Hannah wouldn't know how to be superficial to save her life. And Gone Gone Gone had a pretty happy ending too! That book was so full of hope.